So, I’ve mentioned my interest in native plant species a number of times on this blog. 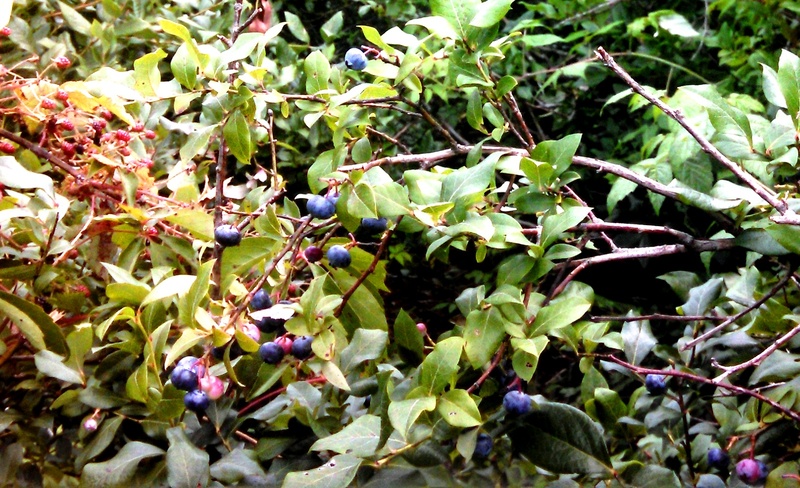 One of my favorite native plants is the blueberry! It’s delicious and a perennial and it grows well in my region. Vaccinium corymbosum (or highbush blueberry) is native throughout the eastern United States, and generally grows in acidic, low-nutrient, moist habitats such as bogs, lakeshores, and also in some drier habitats such as the Appalachian “heath balds.” This species is extensively cultivated and is most likely the species you have experienced if you have gone blueberry picking at a commercial farm (although there are some other species and hybrid species used in some cases). V. corymbosum is a member of the Ericaceae, a family of plants made up primarily of trees and shrubs. Many species in this family are adapted to nutrient-poor growing conditions, so species of this family are characteristic plants in nutrient-poor habitats, such as bogs and heaths that have extensive shrub layers. This winter I’ve been experimenting in trying to grow this species for my garden. Many permaculturists have noted the importance of genetic variability in a permaculture system (for example, Phil Rutter), and one of the best ways to get genetic diversity is by starting plants from seed. Blueberries are not self pollinated, so seeds collected in the wild or from commercially harvested blueberries will yield variable results. Still, I think it’s a fun experiment, I don’t mind if all of the plants I get are not up to commercial blueberry quality. So I started with some frozen blueberries I picked last summer at a local pick-your-own place. These are from a commercial cultivar, which is not as great as wild blueberries, but one step at a time. I followed the directions from the University of Maine and used berries that had been frozen for at least 90 days (I think mine had been frozen at least 120 days). I extracted the seeds using a blender and some water (the seeds will sink to the bottom) and then scattered them over some peat moss in a shallow plastic bin. 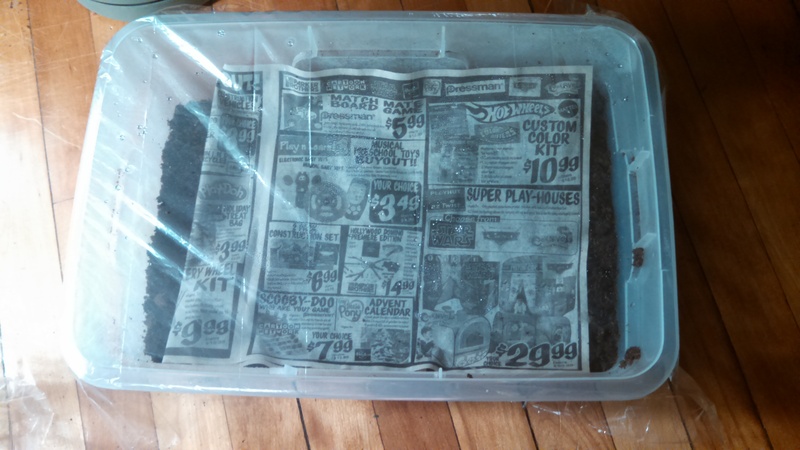 I covered the seeds with damp newspaper and covered the top of the bin with plastic to keep the humidity up. It took about a month, but I started to get some germination back in February. I don’t have any south-facing or particularly sunny windows, so after the seeds germinated I kept them under compact fluorescent lights for about 16-18 hours each day. The seedlings are doing well now, growing at about the rate I expected (it takes blueberries about two years to get to be about one foot tall and right now at two months my seedlings are about an inch and a half to two inches tall). I’m planning on moving these seedlings out to my cold frame this week so that they can get more sun. More about my newly built cold frame soon! Also hopefully in the future is trying this process out with wild blueberries (if I can find a good patch that hasn’t already been picked over by wildlife sometime this summer). What are your favorite blueberry recipes?